Nursing vs formula. Private school vs public school. Sack lunch vs cafeteria. Sports vs arts. 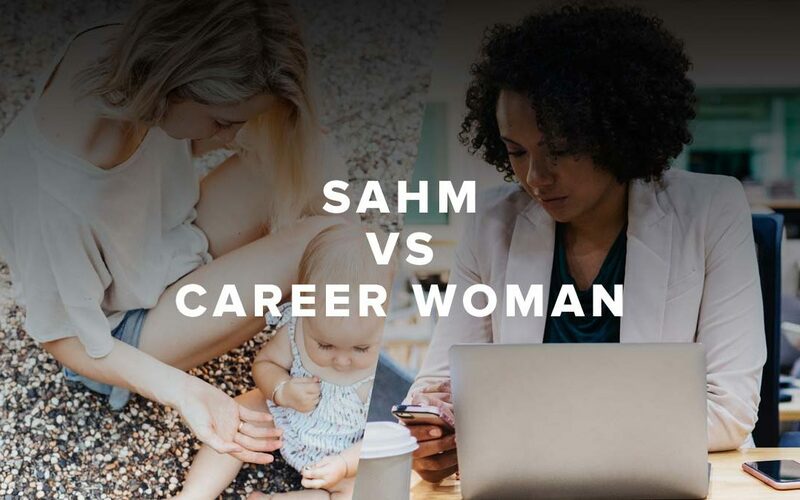 Of all the decisions moms have to make, the most polarizing is probably whether or not to work outside the home; to be a SAHM (stay at home mom) or a Career Woman. This has been hotly debated for decades, but I am about to give you the definitive answer as to which is best. Neither. Both. It depends. That’s my answer. You’re welcome. The choice to either go back to work after having a baby or not is a personal one. It could come down to money or personality or tradition but in this day and age, there’s no one right answer. What’s best for your family is the right answer. But that’s not all I have to say about this. There’s more. SAHM vs Career Woman is not a morality issue. There’s no right decision that covers everyone. If you have decided to stay home, great. But don’t look down on moms who went back to work. And “working” moms, don’t look down on those who didn’t. SAHMs aren’t dumb or lazy. Career moms aren’t ignoring their kids. Moms are all just trying to do their best. So now that you moms have stopped judging each other, let’s take it further. Moms, encourage each other. You all have gifts and talents that can benefit each other. So build each other up. Help each other out. Encourage each other. Extend grace. The decision to love each other is much greater than the decision of whether to be a Career Woman or a SAHM. After all, we are #bettertogether. Well said, thank you! I’ve been both and neither is a walk in the park. It boils down to one’s family dynamic and choice.